Dufour Yachts was founded in 1964 by engineer and racing sailor Michel Dufour. Dufour was working at a factory that manufactured parts for locomotives. The first Sylph was launched in the fall of 1964, that went on to be a huge success. 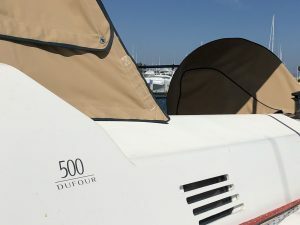 Over 400 models were sold from 1964 to1974 and launched the company that was soon to be known as Dufour Yachts. 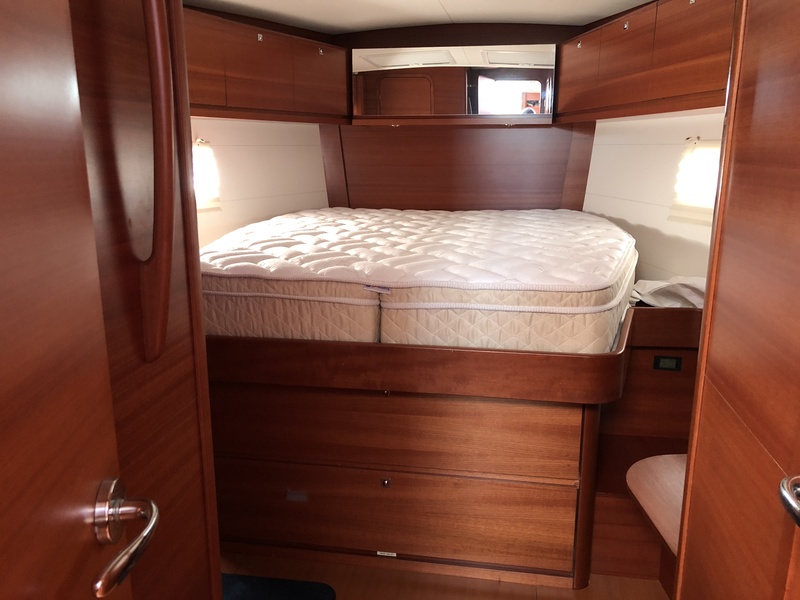 We provided mattress and bedding for this Dufour 500 client. We make everything custom according to the size and shape of your bed. We can use any material you want but we always recommend latex for our mattresses and toppers because its mold and mildew resistant, extremely comfortable, flexible, it sleeps cool and it does not absorb smell. For this client, we are providing them our top plush pillow top 9” Admiral. It is constructed with a super comfy 6” (medium) Latex core. We then add 2” of ultra-soft latex Pillow Top and cover it in the plushest of bamboo quilting. The result is truly The Leader of the Fleet. Each boat mattress we make is crafted custom in California and built to stand up to rigors of a marine environment. Moreover, we can add a hinge to any mattress with no additional cost. It makes it very convenient for you to reach underneath storage. We always recommend our customers to get our mattress pad cover to protect your new mattress. A well fit mattress pad not only protects your stateroom mattress but it helps keep your sheets in place. Our custom mattress pad cover will provide an additional layer of comfort for a perfect night sleep and is waterproof, so it will protect your mattress. You can also see the hinge in one of the images on our Admiral pillow top mattress but the great part is, you only see it but don’t feel it because the quilted covers pulls the two pieces together to create a smooth surface. Our 600 thread count Egyptian Cotton sheets work really well with our mattresses. Our sheets are sold as a set including a fitted sheet, flat sheet and matching pillow cases. Comfortable, well-fitting sheets provide a manicured look for your bedding, ease in making the bed and a great night’s rest.